The first thing I always think about when I see the JELL-O Pudding Face commercial is Soundgarden’s Black Hole Sun video. I find Dad’s face-wide grin more creepy than endearing, but at least he’s smiling. JELL-O wants to keep America smiling and they’re giving away free pudding to turn those frowns upside down. The creative minds of Crispin Porter + Bogusky are behind the digital campaign which plays off the Pudding Face TV commercials. 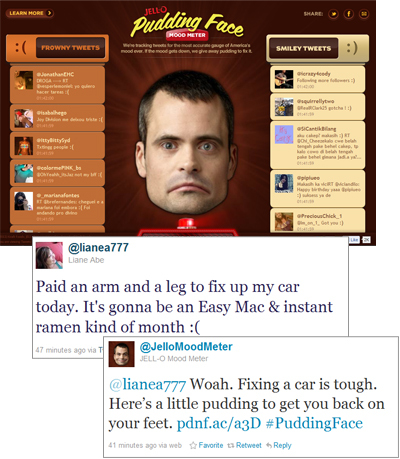 The JELL-O Pudding Face Mood-Meter analyzes the Twitter and pulls in the tweets that include a frowny and happy-face emoticons. The mood meter smiles or frowns depending on which emoticon is featured in the most tweets. When the frowns start to outnumber the smiles, the red light flashes and Jell-o begins giving away free pudding by reaching out through the @Jell-OMoodMeter Twitter account. The frowny Twitter updates have include everything from broken down cars, to missed TV shows, to surviving a hot Texas day. The campaign is supported by an interactive billboard at the corner of West Broadway and Grand in New York City. Photos and a video of the billboard can be seen at the Denver Egotist.